We’d recommend downloading the full suite of casino games at Intercasino, rather than playing the instant play version as you get over 100 games. 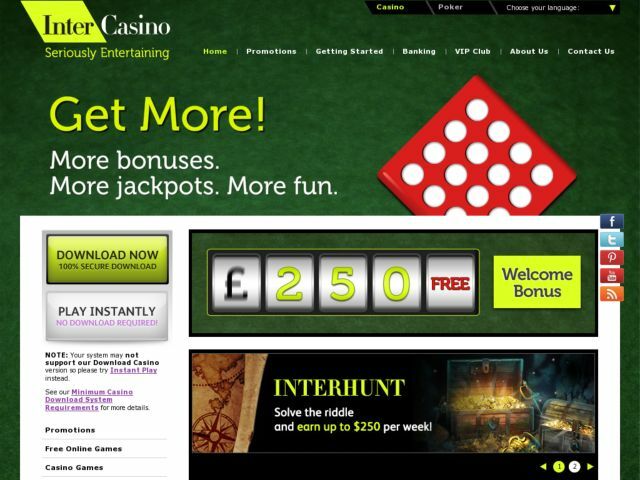 Intercasino offer numerous versions of the most popular classic casino games such as Roulette, Blackjack and Video Poker. Intercasino is one of the most popular casinos amongst slots players as there is a varied choice of quality video slots including bonus feature slots, multi-line slots, progressive jackpots and the exclusive range of Marvel Hero comic slots. The later include a range of video slots featuring the characters from the Marvel comic book series including Incredible Hulk, Spiderman, Fantastic Four and more. There are a total of 8 marvel slots at Intercasino, all featuring some of the best graphics, game play and sounds you’ll find from any slot machine! Intercasino offer 4 pub fruit machines, all with bonus rounds, nudges, holds and gamble features. We’d recommend them all but the favourite is the Hulk fruit machine slot that is a 3-reel slot with bonus round feature. Intercasino reward new and existing customers alike with casino bonuses as part of their £600 a year bonus offer. This is one of the most straightforward bonuses offered by a U.K. casino; simply a 100% bonus up to £50 every month – for life! There are very few wagering restrictions with the Intercasino bonus allowing players to use it on any type of casino game.